RBTH presents a selection of views from leading Russian media on international events, featuring a report on Ukrainian President Petro Poroshenko’s decision to organize a referendum on NATO membership for Ukraine, analysis of the ongoing dicussions over the composition of the new Ukrainian parliament, and the results of negotiations between Iran and the P5+1 group on lifting sanctions against Tehran. Moskovsky Komsomolets reports on a promise made by Ukrainian President Petro Poroshenko that the country will join NATO within six years. 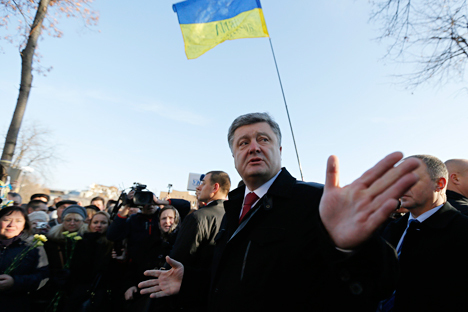 Poroshenko has proposed addressing accession to the military bloc via a referendum. However, NATO Secretary General Jens Stoltenberg said Ukraine can only become a member if it fulfills all the necessary conditions, the newspaper writes. According to Moskovsky Komsomolets, not all current NATO members are of the same opinion. German Foreign Minister Frank-Walter Steinmeier told reporters that he sees no prospects for Ukrainian membership in NATO or the European Union, even in the remote future. Furthermore, the German official suggested refraining from any sort of speculation on the topic in order to avoid a split in Ukraine. Deputy Director of the CIS Institute Vladimir Zharikhin told Moskovsky Komsomolets that Ukraine first needs to resolve its territorial disputes before it can enter NATO. “It can hold a referendum, of course, but that’s unlikely to bring Ukraine any closer to joining the organization,” he said. According to Zharikhin, recent social polls show that there are not many more supporters of NATO accession in Ukraine than there are opponents. “Poroshenko and Yatsenyuk Agree – But Not on Everything,” reads the headline of an article in Nezavisimaya Gazeta, which reports that the first post-election session of the Verkhovna Rada (Ukraine’s parliament) is scheduled for Nov. 27. The Ukrainian deputies are expected to be sworn in, announce the formation of parliamentary factions, and sign a coalition agreement at the first session. The most complicated issue – confirmation of the government’s composition – will be postponed until next week. According to Nezavisimaya Gazeta, since election day experts have been talking about behind-the-scenes disputes between two political forces – Arseniy Yatsenyuk’s People’s Front and the Petro Poroshenko Bloc. An anonymous source told the newspaper that the sides have finally agreed to compromise on the biggest issues. The People’s Front, Yulia Tymoshenko’s Batkivshchyna, Oleh Lyashko’s Radical Party, and Lvov Mayor Andriy Sadovyi’s Self Reliance Party have made their own amendments to the draft coalition agreement written by the Petro Poroshenko Bloc. The newspaper reports that the document no longer contains strict rules allowing the presidential team to control the government. In addition, a proposal to form the governing bodies of the coalition remains in force. The Council will include three deputies from each faction, all parties within the coalition will have one vote each, and the coalition will only adopt decisions on a consensual basis. According to Nezavisimaya Gazeta’s sources, the sides have also reached a compromise regarding staff appointments. Poroshenko has already confirmed that he will submit Yatsenyuk’s candidature to the Verkhovna Rada for the position of prime minister. Yatsenyuk himself is in favor of appointing Oleksandr Turchynov as parliamentary chairman. However, in all likelihood the position will go to a representative from the Petro Poroshenko Bloc, Deputy Prime Minister Volodymyr Groysman. The Kommersant daily writes that the recent talks between Tehran and the P5+1 world powers on Iran’s nuclear problem ended up being fruitless. Not only did the parties not sign a comprehensive agreement, but they also failed to draft much less ambitious framework agreements. The main result of the negotiations was a decision to extend the temporary agreement signed a year ago in Geneva to July 1, 2015. According to Kommersant, at that time the parties agreed to partially fold Iran’s nuclear program in exchange for lifting several sanctions imposed against the country by the United States and the European Union. Sources at the Russian Foreign Ministry told Kommersant that Tehran’s intention to achieve an instantaneous lifting of the sanctions is causing a predicament, because the Western negotiators prefer a gradual approach. Experts polled by Kommersant warn that it will be even more difficult to strike agreements in the future. The recent U.S. Congressional elections swept the Republicans into power in both chambers, and the Republicans have criticized the White House for being too lenient towards Iran and Moscow. According to Kommersant, Chairman of the U.S. Committee on Foreign Relations Robert Menendez has already said that Congress may raise the topic of toughening the sanctions against Iran at the beginning of next year.